Successfully saved Easy Vegan Meatballs to your Calendar. You can also save the ingredients to your Grocery List. Optional to serve with, but obviously! My amazing 5 Minute Pizza Sauce which I always use as spaghetti sauce, so good! Note: I cannot vouch for any subs on these veggie balls. I tested different flours and grains for texture and the above recipe reflects the best results. Whatever you do, don't use oat flour. They were awful with oat flour. 1/4 cup couscous + 1/4 cup water (I used regular original wheat couscous by this brand which is sold at most grocery stores near the rice, but if you need it gluten-free, you can try this brand , it should yield nearly identical results) 1 15 oz can chickpeas, drained and rinsed and patted dry 1/2 cup chopped onion (75 g) 6-8 Tbsp (start with 6, see directions) mild or medium salsa (I used Trader Joe's medium plain red salsa, keep in mind the level of heat and flavor your salsa is will be reflected in the veggie balls) 3 tablespoons ketchup (gives a wonderful depth of flavor and mild sweetness to the balls) optional: 1/2 teaspoon liquid smoke 2 tablespoons dried Italian spice blend (make sure to use one without salt or red pepper, I use McCormick brand) 1-2 teaspoons regular chili powder (I used 2 and it has a kick of heat, use 1 for less spicy) 1/2 teaspoon black pepper 1/2 teaspoon + 1/8 teaspoon fine sea salt 1/2 cup brown rice flour Optional to serve with, but obviously! My amazing 5 Minute Pizza Sauce which I always use as spaghetti sauce, so good! 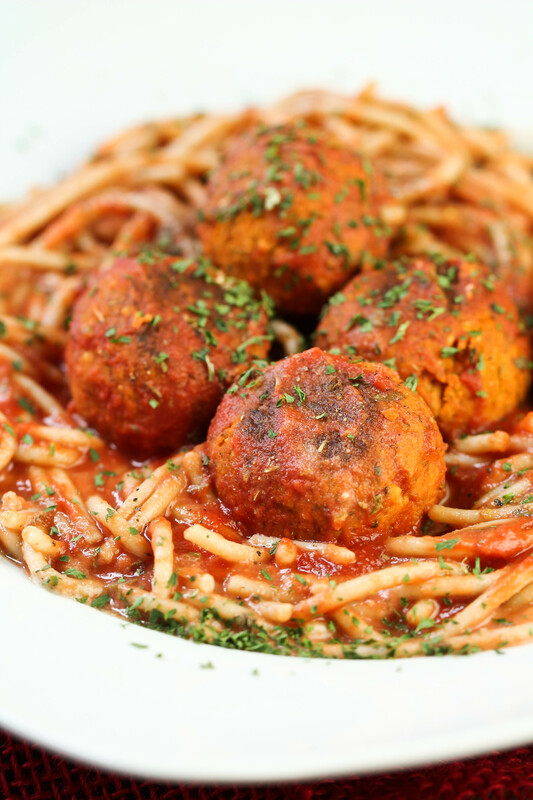 Cooked spaghetti Note: I cannot vouch for any subs on these veggie balls. I tested different flours and grains for texture and the above recipe reflects the best results. Whatever you do, don't use oat flour. They were awful with oat flour.